Isabela Ferrari is academic coordinator of Instituto New Law and a federal judge at the Federal Regional Court of the 2nd Region (TRF2). Isabela Ferrari is academic coordinator of Instituto New Law and a federal judge at the Federal Regional Court of the 2nd Region (TRF2). She holds a master’s in Public Law from the University of the State of Rio de Janeiro (UERJ) and has previously worked as a Visiting Researcher at Harvard Law School. 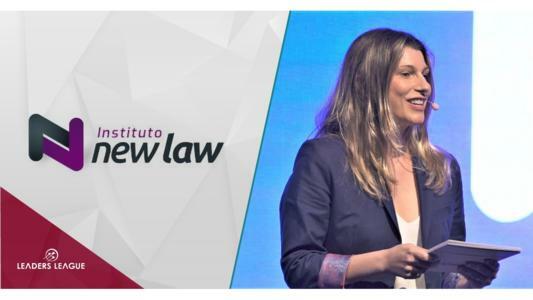 In this interview Ms. Ferrari discusses New Law’s present initiatives and goals for the future as well as recent trends in Brazil’s technology universe. Leaders League. How did Instituto New Law come about and what is its purpose? Isabela Ferrari. Instituto New Law aims to transform the way law is taught in Brazil. The institute was launched soon after some of our founding members helped to organize a conference at Harvard Law School. Throughout the event, it dawned upon us that there is a disconnect between legal education in Brazil and the realities of a today's global economy, a gap which leads to the discrediting of law as an efficient way of resolving modern problems. Our founders realized that if Brazilian professionals enjoyed greater access to cutting-edge technologies, they could make important contributions to the global technological debate and become agents - and not victims - of the exponential change which is taking place worldwide. To achieve our goal of improving the quality of legal education in Brazil, New Law operates on three fronts: (i) full-day events, in which a particular topic is addressed in its many aspects; (ii) missions abroad, in which professionals undergo an immersive experience combining a relevant practical agenda with a strong academic agenda; and (iii) nanodegrees and postgraduate online courses, a strategy which enables cutting-edge knowledge to reach Brazilians in the most remote corners of our country and even abroad. New Law respects its DNA by ensuring technology is at the core of every discussion. The institute is committed to propagating the cutting-edge legal knowledge currently offered at centers academic of excellence such as Harvard, MIT, and major European universities. In addition, New Law seeks to provide students with a unique learning experience. On the 27th March, New Law’s annual meeting entitled ‘Technology and the Future of Humankind’ took place in São Paulo. Could you tell us more about the event? Our annual meeting is a pioneering initiative which aims to discuss key issues from various angles. For our very first event, we could not have chosen a better topic than technology and its impact on our ways of being. Faced with the technological advances that permeate all sectors of the global economy, every profession must urgently adapt to its new realities. Understanding the exponentiality of the technological revolution and its consequences on our daily lives allows participants to reflect on the present situation in their fields and the business opportunities which are arising in their sectors. With these opportunities in mind, individuals will be able to walk a more promising path towards success. The event was held during the morning and afternoon of March 27th, 2019, at the American Chamber of Commerce (AmCham) in São Paulo, and brought together a range of legal professionals (lawyers, public agents, regulators), executives interested in the field of law (investors, economists, CEOs , CTOs), as well as students and professionals from myriad fields looking to strategically position themselves in the market, among others. An estimated 1,000 people attended the event which, for the first time in Brazil, brought together experts from Harvard, MIT, Silicon Valley, China, France, as well as notable Brazilian speakers to discuss topics such as the future of the legal profession, the impact of the IoT on the labor market, new trends in compliance and the ways in which technology is reframing law. What initiatives does the institute have lined up for 2019? In 2019, in addition to our annual meeting, New Law will embark upon two missions abroad. The first mission will take place from April 23rd to 26th in New York and will focus on anti-corruption and compliance initiatives. It will include visits to the New York Stock Exchange (NYSE), The New York Bar Association, forensic investigators and prominent law firms, as well as an intense academic agenda at Fordham University and an additional visit to Columbia University. Our second mission, focused on Law and Technology, will take place in Israel from November 17th to 22nd and includes visits to research institutes, startups, as well as a major academic outing to two of the largest Israeli universities. In addition, we will soon be launching New Law’s postgraduate courses on Law and Technology. At first, New Law will offer three degrees: Public Law, Govtech and Regtech; Criminal Law, Anti-Corruption and Compliance; and Civil Procedure, Negotiation and Arbitration. Our model is totally different from anything else currently available in the market both in terms of content and in how we deliver knowledge. New Law’s online courses will provide an effective and exciting learning experience, enabling Brazilians from all over to access cutting-edge knowledge and incredible professors without leaving their homes. Over the last 12 months, which notable trends have arisen in the Brazilian technology and innovation spheres? Technology has been driving a silent revolution in the Brazilian legal market, both in the public and private sectors. In the public sphere, the Brazilian Supreme Court recently began using an AI platform called VICTOR to assist in judgements and there are reports that other courts are currently seeking to develop similar mechanisms to manage caseloads, provide legal counseling to parties and even draft judicial decisions. With regards to the private sector, innovative law firms are beginning to replace lawyers in charge of repetitive tasks with high-end software which increases the speed, accuracy, and efficiency of legal services. Data analytics, for example, has been increasingly used to predict the outcome of cases and define optimal dispute resolution strategies. New service delivery models, related to the use of blockchain and new forms of work organization, known as the "shared economy" have challenged traditional legal models and created a new market in which professionals with decades of experience are now forced to compete as equals with new graduates. The network of the Brazilian Association of Legaltechs and Lawtechs (AB2L), for example, has been growing exponentially since its creation. Even conservative fields, such as compliance, are being affected by technological trends which requires practitioners to constantly update their legal knowledge to remain competitive. Professionals who wish to survive in this “faster future” (Joi Ito) and remain ahead of the curve must cultivate the ability to constantly adapt.